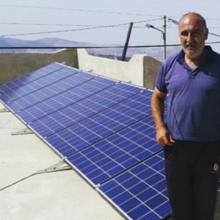 In December 2015 our “Rooftop Solar Project” for a multi-household multi-location project comprising rooftop solar PV installations on 400 low-income households across Jordan won the Middle East Solar Industry Association’s (MESIA) award. At the time the total capacity of the project was 600kWp. The project has grown to 700 households now. The Rooftop Solar Project, implemented by MASE under a turnkey engineering, construction, procurement, operations and maintenance contract with Jordan’s Ministry of Energy & Mineral Resources’ Jordan Renewable Energy & Energy Efficiency Fund (JREEEF) and Mercy Corps represents the implementation of an innovative private public partnership model to introduce clean energy solutions on a mass scale, delivering immediate impact.